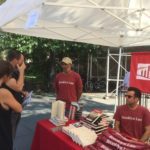 On September 16, 2018, as part of the Brooklyn Book Festival, C-SPAN’s Book TV came to the Brooklyn Law School Library. Book TV aired from 10 AM to 6 PM from the Phyllis & Bernard Nash ‘66 Reading Room on the third floor of the library, covering eight lively author panels that debated the panelists’ works on immigration, innovation, the squeezing of the middle class, and other timely topics. 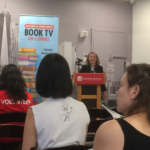 BLS Interim Dean Maryellen Fullerton kicked off the programming in the morning, welcoming participants and noting that Brooklyn Law School has long been an integral part of the Brooklyn Book Festival. 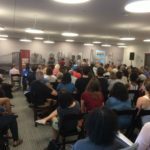 The Nash Reading Room was filled to capacity for many of the panels, including War on Truth and Journalism, featuring Linda Greenhouse, April Ryan, and Eli Saslow, and moderated by BLS Professor and President of the ACLU, Susan Herman. 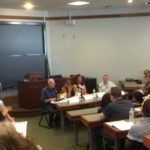 Brooklyn Law School also hosted panels in the student lounge and in Room 401, and an estimated 2,500 visitors came to BLS for the festival. Getting to engage with authors while snagging Book TV tote bags and other swag? Not a bad way to spend part of the weekend! 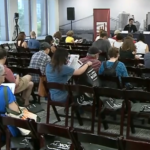 This entry was posted in Brooklyn Law School and tagged BKBF, Book TV, Brooklyn Book Festival, C-SPAN on September 20, 2018 by Eric Yap.